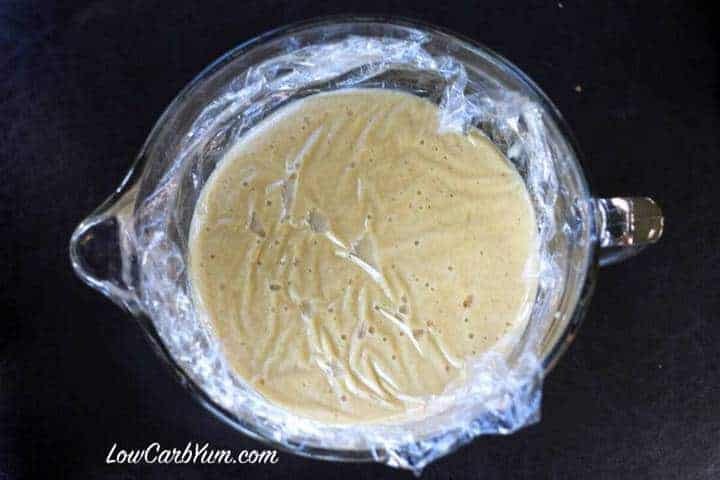 A low carb homemade butterscotch pudding recipe from scratch made with butter and a brown sugar substitute. It fills you up with only a small portion. 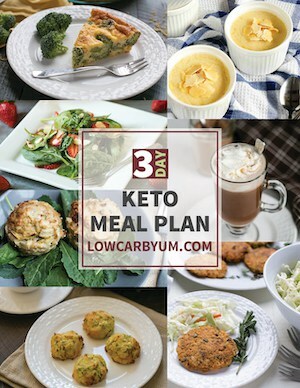 I’ve got a new favorite low carb ingredient! It’s coconut cream. Are following a Paleo diet or just want to cut out some dairy? 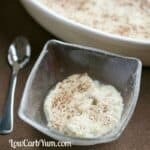 Coconut cream is the perfect dairy free substitute for heavy cream in low carb recipes. Of course, it’s not the best option if you are allergic to coconut or just don’t like the taste of coconut. I happen to love coconuts and all the wonderful benefits that come with coconut products. I’m even doing oil pulling first thing in the morning with coconut oil and beginning to see the benefits. 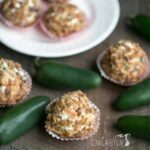 I’m hoping to share my experience with oil pulling soon on my other blog, All Natural Ideas, as it doesn’t really fit this low carb recipe site. I buy my Coconut Cream from LC Foods or Thrive Market. You may also be able to get it at an Asian market or Trader Joe’s. Another product that I’ve recently fell in love with is Sukrin Gold. 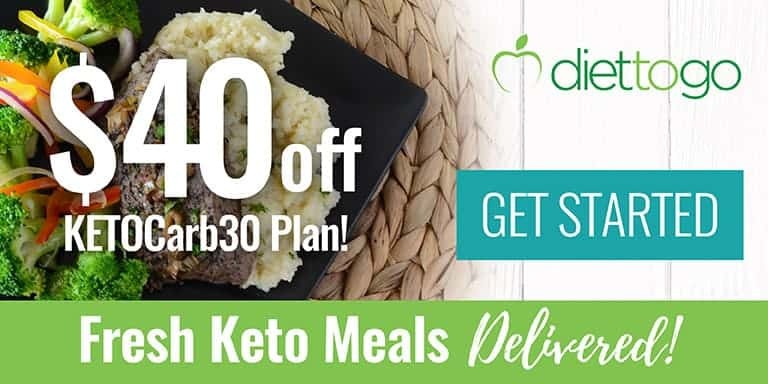 It’s my favorite product from SukrinUSA because I finally found the perfect low carb substitute for brown sugar after years of searching for it. 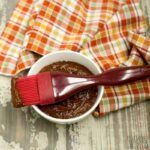 I have tried other brown sugar replacements, but always turned to adding a little blackstrap molasses to get that authentic taste and texture that brown sugar brings. No need for that anymore! One of my favorite flavors made with brown sugar is butterscotch. It’s difficult to create this flavor without molasses, but Sukrin Gold does a nice job and it shouldn’t spike your glucose levels like molasses can. 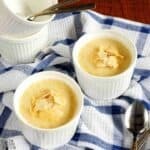 For this homemade butterscotch pudding recipe, I did use butter. But, ghee could be used for dairy-free. 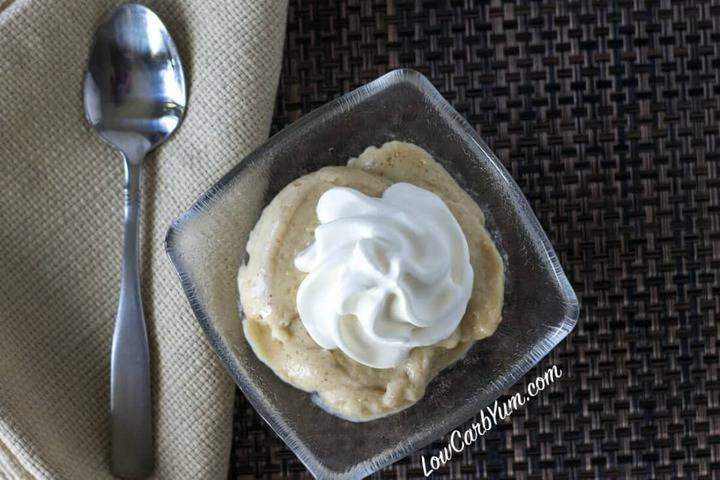 To make this pudding low carb, I used coconut cream and Sukrin Gold. There are my two new favorite ingredients. Although I’ve been moving away from using xanthan gum, I still have a little bit left in my bottle so it was the thickener I used. Guar gum is less controversial than xanthan gum. 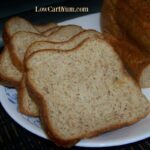 I’ve seen some low carb recipes that use psyllium husk in place of xanthan gum, but I haven’t done a lot with psyllium. I need to experiment more with using psyllium husk as a thickener, but guar gum works just like xanthan gum. 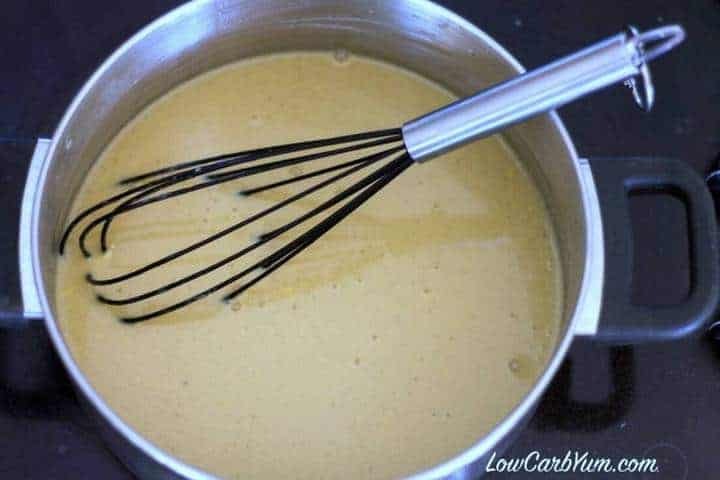 This homemade butterscotch pudding recipe from scratch was thick enough to use as a pie filling. It did seem a bit thin after adding the xanthan gum. But, the pudding gets really thick after chilling in the refrigerator for a few hours. You can spoon the pudding into individual serving dishes if you’d like. A little goes a long way because it’s very high fat. So, it’s very filling. I opted to pour the hot pudding into one big bowl and lay a sheet of plastic wrap on top so a skin didn’t form. Totally optional. You can always peel the skin off if you don’t like the idea of plastic touching your food. 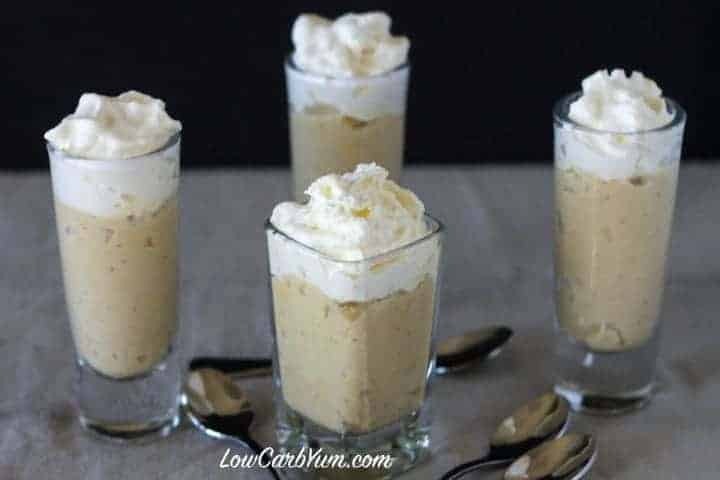 This homemade butterscotch pudding recipe from scratch is also super cute in little shot glasses topped with whipped cream. 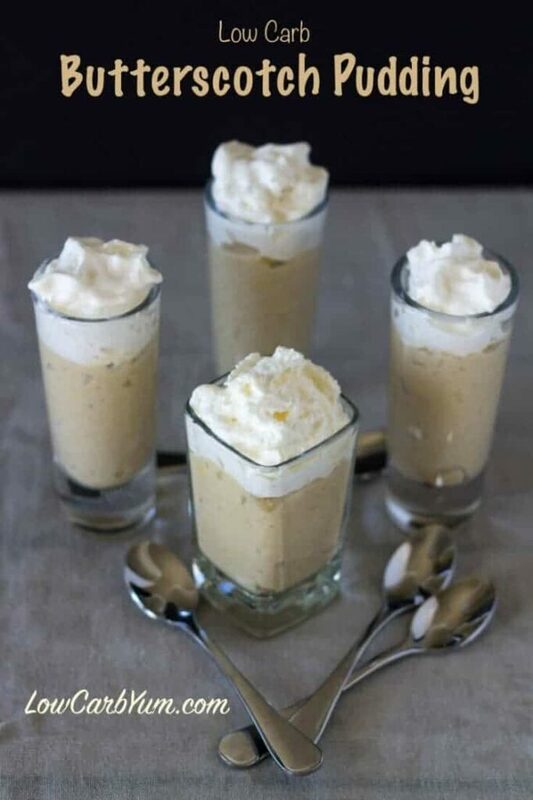 A shot glass portion is the perfect serving size as the high fat of the Coconut Cream will fill you up fast. 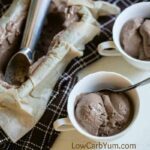 So, definitely give this low carb pudding from scratch a try! 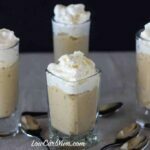 Here's a low carb butterscotch pudding that will fill you up with only a small portion. 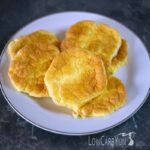 It uses the traditional butter along with a brown sugar substitute. 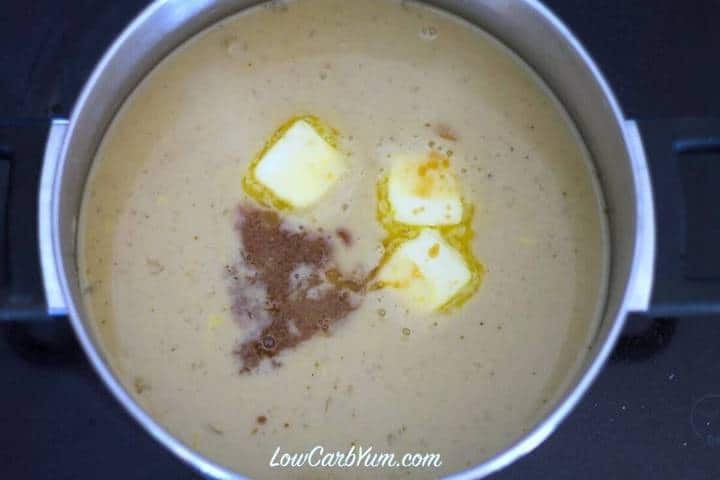 In large saucepan, combine Sukrin Gold, salt and coconut cream. Cook and stir over medium-high heat until boiling. Reduce heat to low; cook and stir for about 2 minutes longer. Slowly stir in about 1/2 cup of hot mixture into egg yolks; return all to pan. Bring to gentle boil, stirring constantly. Cook 2 minutes or until mixture is thickened. Stir in stevia liquid, butter, nutmeg, and vanilla extract. Transfer into large bowl or individual serving cups. Cover and refrigerate until chilled. Serve with whipped cream if desired. 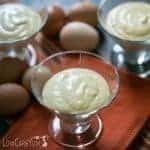 It's important to temper the eggs and keep the mixture at a temperature where the eggs won't cook. Otherwise, there will be bits of cooked egg in the pudding. So this is an essential step that needs to be done correctly. However, if you do end up with the cooked egg, you may be able to get most out with a mesh strainer. I did half recipe, and tried psyllium husk since i didnt have the other 2 thickening options on hand. The flavor was pretty good- But mine was still quite thin- it wasnt liquid, but more of a consistency similar to yogurt (the kind that isnt stiff and can drip off a spoon) wondering if maybe a 3rd yolk would help thicken more, if the thin consistency was due to the husk, vs xanthan gum? 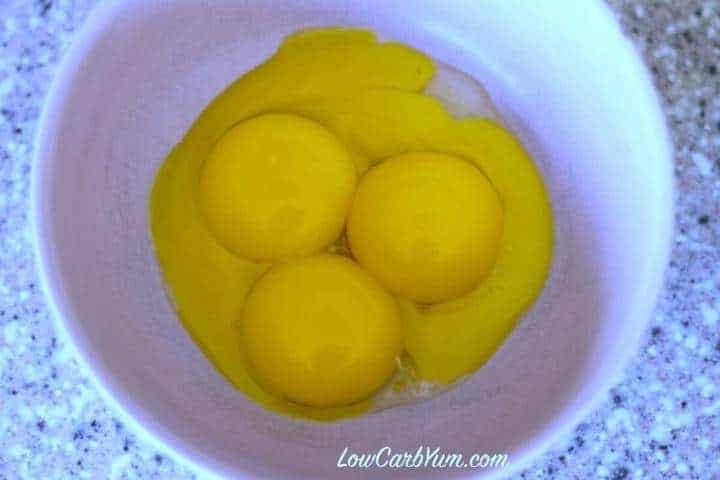 You could try adding another yolk. I prefer using either xanthan gum or glucomannan powder for thickening. 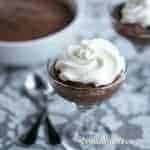 Love the sound of these puddings especially with the whipped cream on top! Could you tell me the approximate volume of each serving? It’s about 1/2 cup or a little less from what I recall. Could you use heavy cream instead of coconut cream? You could replace the coconut cream with heavy cream. Each can is about 13.5 fluid ounces. I use the 13.5 ounce can by LC Foods. Just be sure that the coconut cream is low carb. I’ve seen many that aren’t. This is so delicious! Since Whole Foods only carries the 5.4 oz cans of coconut milk I assumed you meant a “full size” can like what they offer at Trader Joes. I only had English Toffe flavored sweet drops on hand and “Oh my Yum” was this so good!!! Thanks for the awesome recipe. I bet the toffee flavor was great in this! I did use the full size can similar to what TJ’s sells. 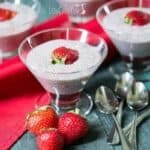 Is the coconut cream sold at Trader Joes acceptable to use in this recipe? It doesn’t pour very easily out of the can but would probably be fine once it’s warmed up. Yes! Any coconut cream can be used. The LC Foods brand is also thick from the can due to the high fat, but thins as it is heated.